John Silverio is an architect who writes. John started writing as a way of working out or clarifying some of the ideas about designing architecture that were occurring to him. These thoughts were kept as journal notes and were accompanied by sketch ideas for buildings. Writing seemed to be an integral part of the design process. It was a way of weaving together theory and practice. These notes were eventually edited into "RADIANCE INDWELLING - Notes and Sketches about Spirit and Architecture". Journaling has continued to be an almost daily exercise and a resource for future writing. Eventually, two more themes distilled themselves out. The first was about the design of wood heated houses focused around a central masonry heater and chimney. These ideas resulted in "HEARTHSPIRE - Designing Wood Heated Houses". 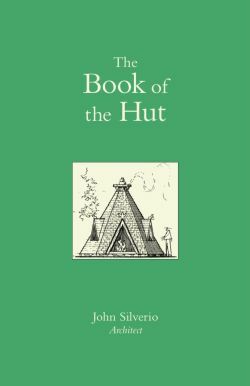 The second was a study of the evolution of basic forms of habitations and this produced "The BOOK of the HUT". Taken together they reveal, in all their facets, the design thinking and inspiration behind a lifetime of work. 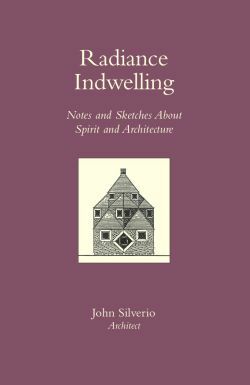 "RADIANCE INDWELLING - Notes and Sketches about Spirit and Architecture" is the most philosophical of the three books. It is a distillation of some of the motivating thoughts behind John's design work. As such, one can share his notes and sketches from more than 42 years of journal keeping. It moves from ideas about the nature of life to thoughts about form, materials, construction, style, geometry and social change. Far reaching, it explores the influence and expression of spirit within the design of our living spaces. The book includes over 200 sketches on it's thought provoking journey. 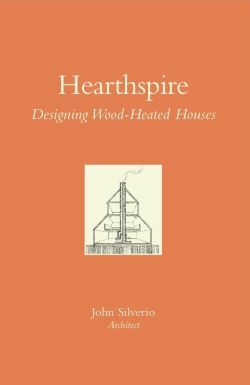 "HEARTHSPIRE - Designing Wood Heated Houses" is more of a design resource book. Having lived in Maine for 37 years and burned wood as a way of heating their house John speaks with firsthand knowledge about burning wood cleanly, harvesting firewood sustainably, and designing an efficient natural house and heating system. His houses are designed around a central chimney and are shaped to take advantage of natural air movement. The wood burning system of choice is the masonry heater due to its safety, efficiency and beauty. However, wood stoves and pellet stoves are also addressed. The hearth centered home is discussed in detail and includes history, details of masonry heaters and a sampling of house designs. The image of the hut looms prominently in John's mind. The hut represents the essence of habitation. All house design draws it's inspiration from the hut. In order to know the hut better, a study of its history in folklore, fairy tales, and in many cultures was undertaken. To this was added ways that we can experience the hut anew, by building recreational huts, children's play huts as well as full sized houses designed along the hut theme. The Book of the Hut includes over 100 illustrations as it explores the origins of architecture. © COPYRIGHT 2010 JOHN SILVERIO, ALL RIGHTS RESERVED.